Hairy cell leukemia is B cell with hair like projection. Hairy cell leukemia is presented with signs and symptoms such as susceptibility to infection, splenomegaly ( enlargement of the spleen ) and hepatomegaly ( enlargement of the liver). The treatment of hairy cell leukemia may include chemotherapy such as Cladribine ( 2 cholordeoxyadenosine). Hairy cell leukemia is commonly affecting middle aged and elderly men. 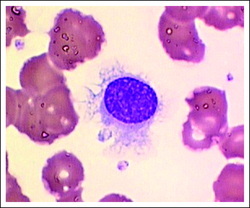 Peripheral blood film/peripheral blood smear may reveal the present of hairy cell and pancytopenia. Bone marrow analysis may reveal interstitial infiltration of the hairy cells. Hairy cell leukemia will stain positive for TRAP. ( Tartrate resistance acid phosphate). 1.Saven, Alan, Carol Burian, James A. Koziol, and Lawrence D. Piro. “Long-Term Follow-Up of Patients With Hairy Cell Leukemia After Cladribine Treatment.” Blood 92, no. 6 (September 15, 1998): 1918–1926. 2.Sebahoun, G., P. Bouffette, and G. Flandrin. “Hairy Cell Leukemia.” Leukemia Research 2, no. 3 (1978): 187–195. doi:10.1016/0145-2126(78)90036-X.